This lab is an introduction to Python programming using the Linux Computers in Phelps 3525 and CSIL. You will write your first Python program that will print a specific text output on your computer display. The TAs in the lab are there to assist you. This assignment is designed to make sure you are comfortable working in the computing environment and know how to submit your work. It is mostly about mechanics, not concepts. As a result, this assignment is not particularly intellectually challenging. Future labs will require quite a bit more thought! If your account doesn’t work, ask a course helper for assistance. On the Linux systems, there are a lot of things we can do with pointing and clicking with the mouse, just like on Windows or Mac. But there are also many things we can only do with the command line, or can do more easily with the command line. So, one of the first steps will often be to bring up a “Terminal” window—a window that gives us access to the Linux “command line”. Find the Applications Menu at the top left of the screen. Select System Tools, then Terminal (the icon should look like the image shown at right). A Terminal Window should pop up. At the command prompt, we are going to type several commands to create folders (called "directories") on Linux in which you can store your programs.The commands are shown in the box below—but first, a little explanation. Each of the cd commands shown below is a command to "change directory"—that is to move into a different folder on the hard drive. When you type cd by itself, it takes you to your ‘home directory’. Each of the mkdir commands "makes a new directory" (i.e. a new folder). For example, mkdir cs8 creates a new directory called cs8 inside the current directory. Each of the pwd commands "prints the working directory", i.e. it tells you where you are on the hard drive. NOTE: your prompt may not be exactly like the one shown here. Instead of -bash-4.2$ , you might have something like [cgaucho@cstl-15 ~]$ . The cgaucho here is your username, the cstl-15 is where you are logged in, and the ~ is your current directory. Don’t be distracted by this detail. To see if it worked, you can use the file manager on the desktop. Drag any windows that might be covering up the "Home" icon on your desktop—it should be near the upper left hand corner of the screen. When you double click on this icon, it will bring up your home directory. You should see inside a folder called cs8. If you double click on that, you should see inside of it, a folder called lab00. Note that you could also use mouse clicks and menu options to create these folders, instead of the command line. If you have trouble with the command line, then for today, it is ok to do it that way. Eventually, though, we want you to learn some of the Unix commands also—the reasons it is important to know both will become more clear as you move deeper into the study of programming and Computer Science. The preliminaries are done—now we are ready to start saving files for Python! IDLE is a piece of software that you use to interact with the Python programming language. As we are using Python version 3 in this class, we also use IDLE version 3. The window that appears should have the Python Command prompt (>>>) in it. This is sometimes called the "Python Command Prompt" window. This is also called the "Python Shell" window. When you have the IDLE window up, you are ready for the next step. In IDLE, select “File=>New File” to open a new “untitled” window for Python code. When it comes up, click and drag the window by its title bar over to the right of your Python Shell window. For this lab, there is one goal: write a Python 3 program that prints the string Hello, World! as its output. In this sense, we are following a long tradition: for more than 40 years it has been a tradition to make printing Hello, World! be the first thing you do when learning a new programming language. We will save the file under the name hello.py—it is very important that is has exactly that name, or the gradescope system will not run your program correctly. You are encouraged to do that, because it helps someone looking at your code know that you wrote it. But, other than that, it isn’t necessary. In general, in computer programming, a comment is something that is intended only for human readers of the code, and is otherwise “ignored by the system”. Nearly every programming language has some way to express comments, though the exact rules for formatting of comments–that is, the syntax of comments–differs from one language to another. In Python, a # starts a comment. Everything from the # to the end of that line is part of the comment. Step 7: Running your program. To run your program, select the “Run=>Run Module” option from the menu. You should see the “Hello World!” message. I’ll demonstrate the use of Idle in lecture, since its much easier to just follow along than to try to explain everything in a text document. If you need a further demonstration, you can find one on YouTube. For example: This video starting at 4:53 (That video is for Python 3.1, but the stuff shown in the video is the same across all versions of Python 3.x). Next, we’ll try submitting our program to Gradescope. You’ll get some immediate feedback on whether you did it properly. If you are registered for the course, you are should also be registered at Gradescope.com (via your @umail.ucsb.edu account) Look in your @umail account for an email from the Gradescope system inviting you to create a password. Follow the instructions to set your password; then you should see “CMPSC 8” in your courses for this term. 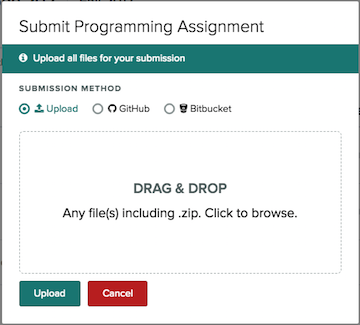 You either can navigate to your file(s) or “drag-and-drop” them into the “Submit Programming Assignment” window. 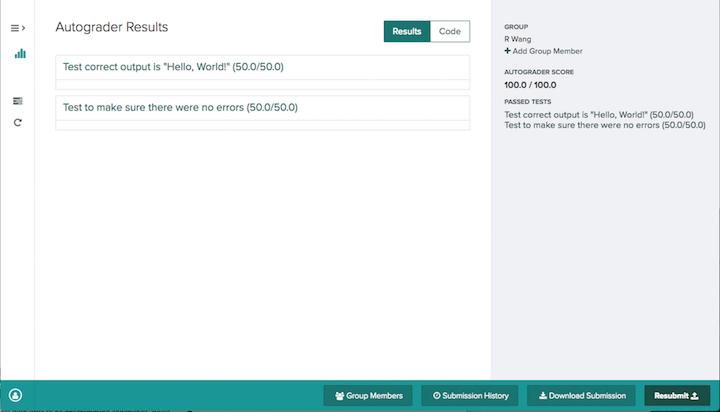 After you submit something on Gradescope, you will have access to the “Autograder Results” page. There is a “Resubmit” button on the bottom right that will allow you to update the files for your submission. For this lab, if everything is correct, you’ll see a successful submission passing all of the autograder tests shown below. If the tests don’t pass, you may get some error message that may or may not be obvious at this point. Don’t worry - if the tests didn’t pass, take a minute to think if your print statement is EXACTLY like stated in the lab instructions (including the same capitalization, spaces, punctuation, etc.) and the file name is EXACTLY hello.py. If your tests didn’t pass and you’re still not sure why you’re getting the error, feel free to ask one of the course helpers. Find the System Menu at the top of the screen.